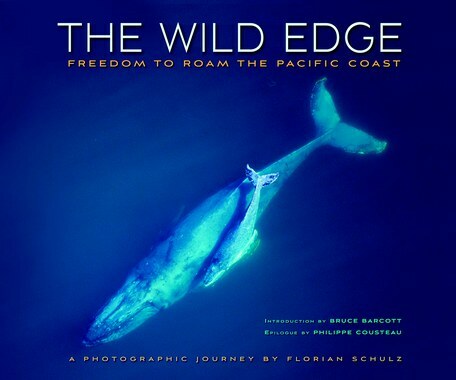 This Fall, Mountaineers Books has published an important book - 5 years in the making - documenting the ocean-based wildlife corridor along our Pacific Coast. Here's an excerpt from the introduction to The Wild Edge written by Bruce Barcott, a Northwest-based best-selling author. This book is about a new way of looking at the world. Begin with the familiar: a map of North America. Hold it in your hands. Now turn it 90 degrees to the right. Let the borders of Canada, the United States, and Mexico fade into pinstripes. Allow something ancient to strike your eyes: the wild Pacific edge, Baja California to the Beaufort Sea, a seam of some 6000 miles (9700 kilometers) where land meets sea and creates one of the wildest and most productive corridors of life on earth. Note the waypoints. Start south at the sunbaked fingertip of Cabo San Lucas, Mexico. Move north to the underwater kelp forests of California’s Channel Islands, past the mouth of the mighty Columbia River that separates Oregon and Washington, through the rocky archipelagos of the British Columbia coast, around the spiked horn of Alaska’s Aleutian Islands, through the choke point of the Bering Strait, to reach the Beaufort Sea and the Arctic Coastal Plain, that expanse of frozen tundra sliding low and humble into the Arctic Ocean. Is it a coastline? Not exactly. The B2B--Baja California to the Beaufort Sea--contains a shoreline, but its reach is broader, deeper, more ample: 6000 miles (9700 kilometers) long (roughly the path of the gray whale migration), about 200 miles (320 kilometers) wide. It’s an area bigger than India, a nation so double-extralarge they call it a subcontinent. This biological corridor, new in name but ancient in its workings, extends inland to sloping mountains where rivers begin and offshore to seafloor cliffs where the continental shelf drops into the abyssal plain. In between lie deserts, forests, islands, estuaries, fjords, archipelagos, and vast stretches of Arctic tundra. It’s a wildlife corridor, a migratory pathway, a trade route, a channel of nutrient flow, a biological hot zone, a corridor of idea exchange and energy transfer. Its constants are energy, movement, and life. For too long we’ve defined it only in parts: three nations and dozens of First Nations and Native American sovereign lands; two Canadian provinces, four American states, two Mexican states; seven major cities and hundreds of counties, towns, and sleepy backwater burgs. These are products of political borders, puzzle pieces meaningful to Homo sapiens but senseless to all the other species that turn the gears of the greater organic machine. For too long we’ve remained disconnected from this great corridor by our limited understanding of the biological motion that quickens it. Now is the time to overcome the limitations of human sight. Time for us to see the full range of the B2B as the gray whale, the Pacific salmon, the black bear, and the western sandpiper see it. Want more? Add this book to your cart.